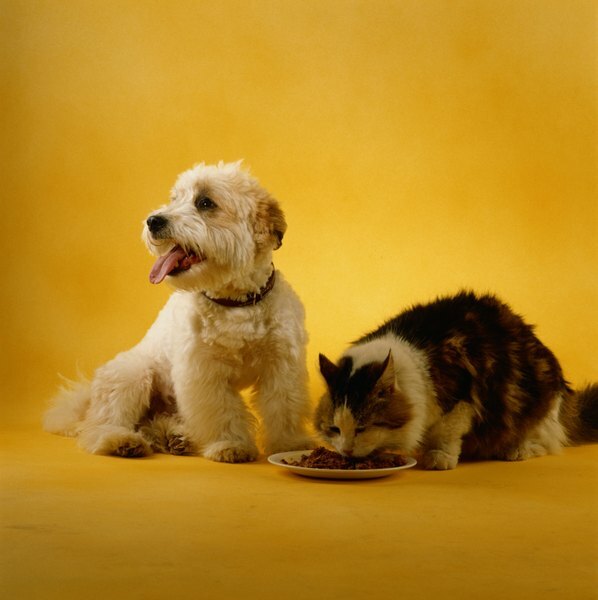 A cat who overeats may be protecting her food from other household pets. If your favorite feline has been packing on the pounds, excessive eating could be to blame. Unfortunately, when a cat eats more than she should, she's putting her health in danger. It's up to you to get her eating habits under control and help her trim down. One reason your cat may eat too much is simply because food is available. While some cats can self-regulate their food intake and stop eating when they've had enough, others gobble up all of the available food even if they are full. If you have multiple cats, your excessive eater may even bully other cats away from their food or sneak bites from a different pet's bowl. In some cases, a cat overeats because she is anxious that food may not be available later. This can be a relic from kittenhood or it can be the result of other household animals attempting to steal her food. Other cats may simply like the taste of their favorite food enough to want to continue eating it after their tummies are satisfied. A cat that overeats may need more protein in her diet and may be consuming more calories in an attempt to get that protein. Overeating leads to obesity, which can cause serious health problems in cats. An overweight cat is at higher risk for feline diabetes, urinary tract disorders, fatty liver disease, heart problems, arthritis, cancer and respiratory diseases. Overweight cats tend to have shorter life spans than thin cats. Because they may have trouble grooming themselves, they are more susceptible to matting and dander. To keep your cat from eating too much, feed her measured portions twice a day. Use the recommendations on the cat food packaging to determine how much to feed her. Different brands have different calorie and nutrient levels, so if you switch brands you may have to change the size of the portion you dole out. 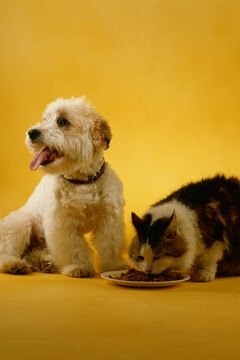 Try to feed your overeater in a room away from other pets so she doesn't get anxious about meals. Switch to a canned food that is high in protein and low in grain products so your cat gets more of her calories from a protein source instead of from carbohydrates. When you switch from one brand or type of cat food (but not from one flavor to another within a brand's offerings), be sure to introduce the new food slowy to reduce risk of stomach upset. Substitute a fifth of her regular portion with the new food, gradually increasing over a week to 10 days until the new food is all your cat gets. Not all cats who eat a lot of food are overweight. If your feline companion consumes more than the pet food packaging recommends, but is she is lean and lithe, she may simply need more calories than the average cat. Extremely active cats require up to 40 percent more calories than sedentary cats, according to the American Society for the Prevention of Cruelty to Animals. A cat's food intake is considered excessive only if it is causing her to be overweight. Signs of obesity in a cat include a rounded abdomen, the absence of a defined waist, ribs that you can't feel when petting her, and noticeable fat deposits on the body. Ann Arbor Animal Hospital: Do You Own a Fat Cat?